Fully compliant with ZIF specification. 3.3V Mini PCI-e SSD (mSATA module) support. 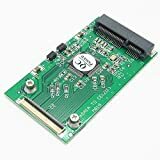 Connect Mini PCI-e mSATA SSD as 1.8″ ZIF SSD, update SSD of your IPOD, PAD or laptop easily. (Do not fit for Apple product). No extra power adapter and drivers needed. Support DOS, Win98/SE, 2000, Server 2003, XP, Vista, 7, Sever 2008, Mac OS, Linux. Size: 6.3 x 3.5 x 0.7cm.